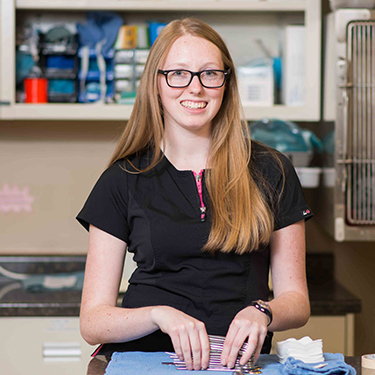 Stephanie joined the PAH team in the fall of 2015 after graduation from the Veterinary Assistant program at St. Lawrence College in Kingston. She is often found on the front desk or in the treatment area giving tender care to all the pets throughout their visit. Stephanie grew up raising Clydesdale horses on her family's farm in Mountain. In 2015 she was the Clydesdale queen. During her spare time, she enjoys showing her horses at fairs and caring for her dogs, Olaf, Jack & Jill and cat, Max. Stephanie is continually providing all our in hospital patients with the best care! When Stephanie is away it definitely goes noticed.